Oh I love love love this color! These earrings are hand made by me using genuine Italian Murano glass beads! This pair of beads is done in a very light Aquamarine glass over heavy layers of genuine 24KT WHITE GOLD! The beads are encased in clear glass layers helping to protect all inside. The beads are made one at a time by skilled Italian glass makers. These do not disappoint! The beads are large and round in shape - just over 1/2 inch across (14mm). 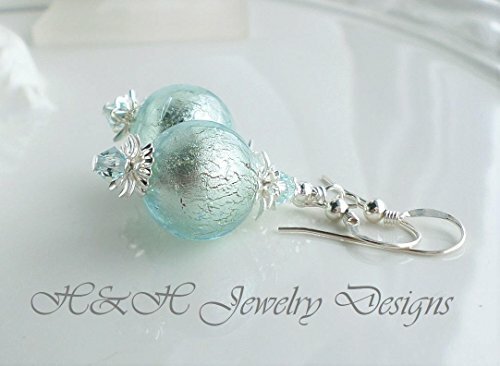 I have added pretty matching Swarovski Crystal accents in very light Aqua, along with silver brass accents and STERLING SILVER french ear wires with a ball and coil design. Total length: 2 inches.